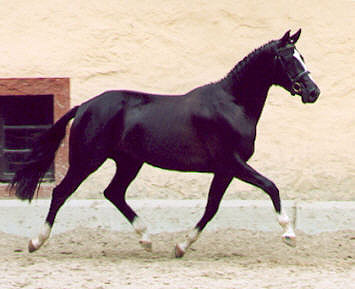 This daughter of the Hämelschenburgian sire Alter Fritz has a marvelous lined body combined with a very expressive type. Her character and temperament are first rated, and three outstanding basic movements belong to her special dividend. Any minute she is in superior style! 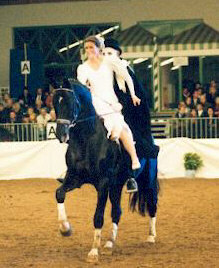 On the occasion of the central mare-show in May 2003 she entered the studbook with 58,5 points (final note 9,0) and she won the Championship in supercilious manner. 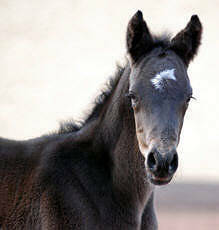 Now she belongs to the highest valued mares of her age-group! 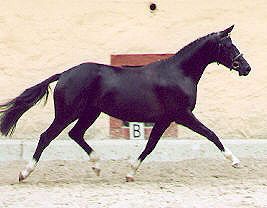 Her sire "Alter Fritz" won Dressagetests up to class M and he will now be schooled for the very high dressage-classes. He is a very talented horse for Piaffe and Passage. 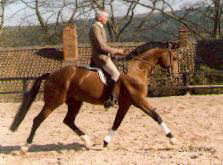 Excellent basic-movements, riding-ability, a very good character are the credit points of this performance orientated stallion. 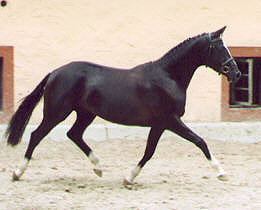 His pedigree is full of dressage-stars: Chardonnay - Rockefeller - Consul and Kokoschka and Postmeister. Greta Garbo's dam - Gloriette III - is also dam of her fullsister Gracia Patrizia both becam the champions of the central stud-book-entering at Moritzburg in their age-groups (3- and 4-years old). 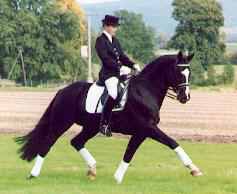 On the dam-line Kostolany and Karon, both S-Dressage-winners, as well as Pregel, an outstanding sire for riding-abilities, are the ideal supplementations to the sire-line. 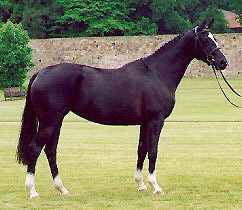 Gloriette's 2nd dam Gurtis is a fullsister to the very successful "Ginster" (sire of the premium-mare "Herzchen"). To the offspring of the dam-line of "Gundula" belong also "Guter Stern" (Champion at the stallion selection), "Guter Planet" (Reserve-Champion at the stallion selection) and "Guy Laroche" (Premium-sire).